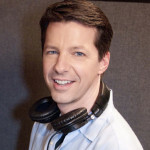 American actor and comedian Sean Hayes (b. 26 June 1970) is best known for his award-winning role as Jack McFarland on the NBC sitcom Will & Grace. He memorably portrayed comedian Jerry Lewis in the made-for-TV movie Martin and Lewis (2002). Hayes has done voice-overs throughout his career, from early TV commercials to Mr. Tinkles in Cats & Dogs (2001, 2010) and the Brain in Igor (2008); he has guest starred in Scrubs and 30 Rock, and hosted Saturday Night Live. Of Irish Catholic descent, Sean Hayes was born in Chicago and grew up in the suburb of Glen Ellyn. His father, a lithographer, left the family, including five children, when Sean was a child. At sixteen, with a crowd of his classmates at Glenbard West High School, Sean appeared as an extra in Winona Ryder’s first movie, Lucas (1986), but at that point he was headed for a career as a classical pianist. He played popular music professionally in a band as well. He attended Illinois State University to study performance and conducting, but left before graduating to work as a music director at the Pheasant Run Theater in St. Charles, Illinois. Also a composer, he contributed original music for a production of Antigone at the Steppenwolf Theatre Company in Chicago. Hayes (at first as Sean Patrick Hayes or Sean P. Hayes) sidelined as an actor in several productions at the Pheasant Run Theater and at the Organic Theatre, and eventually found himself doing standup comedy and improvising with the famed Second City group. He moved to Los Angeles in 1995, where he did comedy, stage work, and TV commercials, eventually getting a role in a made-for-TV movie, A & P (1996). He made his professional film debut in 1998 in the independent film Billy’s Hollywood Screen Kiss. It brought him to the attention of NBC studio executives who cast him as Jack McFarland, a flamboyantly gay, frequently unemployed actor in the comedy series Will & Grace (1998). It was an immediate and long-running hit, winning a Primetime Emmy Award in its third year for Sean Hayes as Outstanding Supporting Actor in a Comedy Series. For each year of the rest of the show’s nine-year run, Hayes got an Emmy nomination. He also snagged six Golden Globe nominations, four Screen Actors Guild Awards, and an American Comedy Award. Probably of greater significance, however, was the affection and attachment he won from millions upon millions of viewers. Hayes meanwhile turned in stellar performances as a supporting actor in the films Pieces of April (2003), Win a Date With Tad Hamilton! (2004), and The Bucket List (2007). “When I came out of my mom’s womb,” Hayes has revealed, “I had ‘sitcom’ stamped on my forehead.” In 2005 he served as executive producer for a reality show about sitcoms called Situation: Comedy for Bravo. Hayes leads his own production company, Hazy Mills, with Todd Milliner, his producing partner from college. In July 2008 Hayes made his New York stage debut as Mr. Applegate / the Devil in New York City Center’s Encores! production of Damn Yankees with Jane Krakowski and Cheyenne Jackson. With his Broadway debut opposite Kristin Chenoweth in the 2010 Broadway revival of Promises, Promises, he received a nomination for the Drama League Award for Distinguished Performance and a nomination for a Tony Award® for Best Actor in a Musical. His appearance as Chuck Baxter stirred up controversy in the press as to whether a gay man can be convincing playing a straight lover. Hayes has defended his unwillingness to discuss his personal life with the reasonable argument that “the less people know about my personal life, the more open-minded they can be about each role I play.” But the situation is that much more difficult for Hayes, since for a decade the world knew and loved him as the flaming Jack. No doubt, though, the sincerity of Sean Hayes’s performance in Promises, Promises, and the surprising warmth and color of his singing voice won the world’s heart all over again. Since the closing of Promises, Promises in January 2011, Hazy Mills has produced several television series: Grimm (2011–present, NBC), The Soul Man (2012–present, TV Land), Hollywood Game Night (2013, NBC), and Sean Saves the World (2013, NBC), starring Sean Hayes. Hayes has also made three movies, The Three Stooges, Hit and Run, and Monsters University.